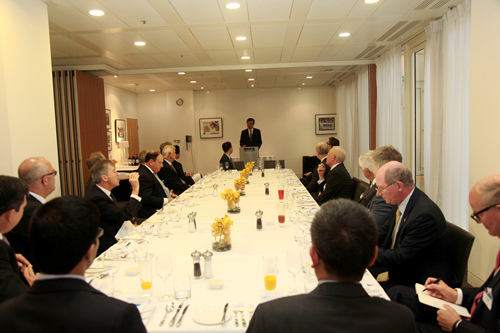 It is a real pleasure for me to join British business leaders at this luncheon. 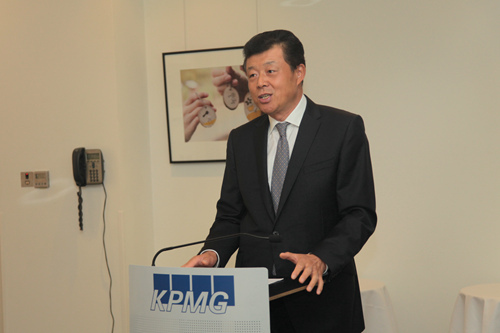 I want to thank our host, KPMG, who are one of the world’s leading accounting and consulting firms. You have come with ideas and questions. I look forward to an in-depth exchange of views with you! Our host Chairman Richard Reid from KPMG has asked me to say a few words by way of opening. I would like to share with you my take on three hot topics about the Chinese economy. First, what is the new model of the Chinese economy? In the first half of this year, the Chinese economy grew by 7.4%. This was a bit lower than the 7.6% for the same period last year. Also, by comparison the annual growth was 7.7% last year. However, if this growth trend continues, China’s GDP increase in 2014 will rank among the world’s top 20. More importantly, this year’s growth is of higher quality. For example, from January to August, 9.7 million jobs were created. That was close to the employment target set for the whole year. CPI and unemployment rates were respectively 2.3% and 5%. These were reasonable and healthy levels. These figures show that there has been a shift in the model of Chinese economy. From the previous single-minded pursuit of high growth rate, the Chinese economy has moderated now to focus more on high efficiency, low cost and sustainability. This is the new model of the Chinese economy. In order to adapt to, and encourage, such changes, the Chinese government is deepening economic reform. While letting the market play a decisive role in allocating resources, we are working to improve the role of the government and strike a balance between the government and the market. The new government has taken steps to delegate power, reduce the items subject to government approval and reform the commercial registration system. As a result of these measures, the enthusiasm of the private sector has been mobilised. The potential of the services sector, emerging industry, high-tech and advanced manufacturing have been further unleashed. · The continuously rising level of education of the Chinese population is optimising China’s human capital. · And China’s innovation capacity is strengthening steadily. All these factors provide a strong support for the new model of the Chinese economy that features high quality, high efficiency, sustainability and moderate growth. Turning to the second ‘hot topic’. How to view China’s anti-monopoly law enforcement? Some recent anti-monopoly cases involving international companies have raised concerns abroad. Some worry that the China is closing its door for foreign investment. This is an outright misreading. · To prevent and stop monopoly. · Level the playing field. · And protect the interests of consumers and the general public. China’s anti-monopoly enforcement treats all market players as equals. Companies investigated and punished include both domestic and foreign ones, Chinese invested and foreign invested ones. Among Chinese companies, there are both state-owned and private ones. Foreign companies only account for one tenth of all companies investigated by NDRC. China’s anti-monopoly enforcement follows strict procedures that are open and transparent. Throughout the process lawful rights of companies involved are fully protected. All case information is made public. Opening up is a long term and basic national policy of China. While enhancing anti-monopoly enforcement, China is also streamlining approval procedures and allowing foreign investment wider access. China has stepped up efforts in IPR protection. Also, China is building a more open and fair business environment for foreign investors. Now to the third ‘hot topic’. How to veiw the development of Shanghai Free Trade Zone or FTZ? The Shanghai FTZ has become a focus of attention from its very beginning. China and the UK have had effective cooperation on this project. Over the past year remarkable progress has been made. In policy innovation, the investment management system centered on a ‘negative list’ has been established. The trade regulation regime focused on trade facilitation is operating smoothly. The financial innovation system aimed at capital account convertibility and opening the financial sector has taken shape. The regulation system designed for transforming government functions has been set up. In terms of attracting investment, by the end of August, more than 12,000 new companies had opened in the trade zone. More than 1600 of them are foreign invested. The number of new foreign invested companies increased by more than 10 fold. In the financial sector, 87 licensed financial institutions and a number of financial services companies have entered the Shanghai FTZ. Shanghai International Energy Trading Centre and International Gold Trading Centre have been launched. In trade facilitation, the first eight months this year saw an increase of 11% in the Shanghai FTZ’s foreign trade volume. In the same period, logistics cost dropped by 10%. The time needed for customs clearance has been reduced by three to four days. More than half of the new companies deal with logistics and trade. These figures show that Shanghai FTZ has stood up to the test and found its feet. In summary, my message is that Chinese economy has a bright future. Chinese markets are becoming more open and fairer. Investment conditions are becoming more convenient and easier. As a result, I hope you will dismiss your worries and have more confidence in the Chinese economy. At the same time I hope you will seize opportunities and strive for greater success. Our host today is KPMG. I like the name because it is also initials for Keep Prosperity and Mutual-benefit Growing! Let us work together to achieve this goal. Thank you and I am glad to take questions.